The article below was originally published by Tim Tibbetts on www.uisgebeatha.org. Written in 1999, shortly after Glenmorangie purchased Ardbeg, it is 'A Study in Contrasts' between Ardbeg and Glenmorangie, providing some great insight into the history of both distilleries. Mr. Tibbetts has kindly granted permission to share his article on the Ardbeg Project, and it is great to see the perspective of these distilleries as seen at the turn of the century. For copyright information, you can see this article on his site here. In the late 19th century, Alfred Barnard embarked on a tour of all 161 whisky distilleries in the United Kingdom, publishing his findings in Harper's Gazette. In particular, he remarked upon the rundown condition of Glenmorangie Distillery - it was "almost in ruins" and "the sad sea waves wash its foundations". He didn't even bother to go into details about the physical plant, as it was due to be torn down and replaced soon. At the same time, he considered Ardbeg Distillery to be somewhat better off - "beautiful" and "picturesque and substantially built." Furthermore, the annual production at Glenmorangie was 20,000 gallons; at Ardbeg it was 250,000. Yet 100 years later, public awareness of the two distilleries, as well as both the production numbers and the condition of the distilleries has reversed - although perhaps not for long, now that Glenmorangie and Ardbeg are under common ownership. Currently they serve the Macdonald and Muir corporation as complementary buttresses spanning (and supporting) the breadth of single malt scotch. These two distilleries, perhaps more than any other two, demonstrate the contrasts available in single malt Scotch whisky - from the light, perfumed, market-dominating Glenmorangie, to the smoky, peaty, yet still floral Ardbeg; the latter is less accessible, but equally widely known and sought after among the dedicated fans of the water of life. The story of Glenmorangie and Ardbeg contains even more contrasts - although both are located on the sea, Glenmorangie fronts on the Moray Firth in the far northeast of Scotland; in fact, high tides have been known to set the barrels afloat in some of the near-sea-level warehouses. 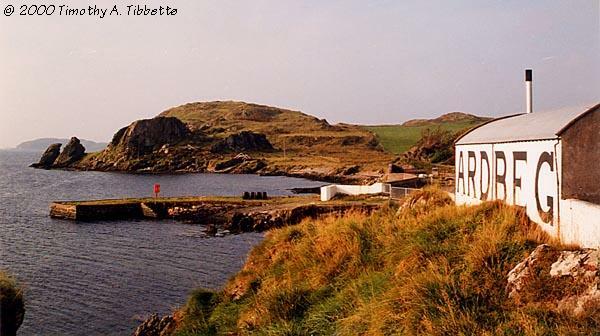 Meanwhile, Ardbeg is located far away on the south shore of the western island of Islay. Glenmorangie is a very lightly peated malt (averaging less than 2 ppm of phenols), while Ardbeg is the most heavily peated of all scotch whiskies, coming in currently at 50+ ppm (although not too many years ago this number was 70+). Similarly, the water used by Ardbeg is soft and peaty; that preferred by Glenmorangie is hard and mineralized. The stills of Ardbeg are shorter than average; Glenmorangie's are the tallest in Scotland. However, both whiskies can exhibit a very complex nose, with perfumy/floral character, and both whiskies are available in bottlings much sought after by collectors and drinkers. This past fall (September-October 1998), I had the privilege of touring both distilleries along with Bruce Ridley, and talking with the distillery managers (as well as sharing a wee dram or two); at Glenmorangie, the manager is Graham Eunson, one of the current "Sixteen Men of Tain" who produce Glenmorangie. At Ardbeg, the manager is Stuart Thomson, who was also one of the Sixteen until his appointment at Ardbeg. Whisky certainly runs in the Thomson family, as Stuart's wife, Joy, runs the Ardbeg visitor center (with help from their newborn son Robbie), his father George was formerly one of the Sixteen (assistant manager), and his mother is still employed at Glenmorangie as a tour guide. Whisky-making is a seemingly simple endeavor, using only four major ingredients - water, barley, peat, and yeast - and some distilleries pride themselves on eliminating peat from the equation (although that is hard to do entirely, given than much of the water in Scotland flows through or over peat at some point in its journey to the sea. However, the differences between the products of different distilleries are readily discernible, even in the raw spirit fresh from the still. The basic process varies little from distillery to distillery. First, barley is acquired, then alternately soaked and dried in "steeps" for about three days; once the grain has absorbed enough water and oxygen, it is dumped on the malting floor, and spread out to a depth of 4-6 inches. On the malting floor, the barley starts to warm up and germinate. Over the next week or so, the barley is turned about twice a day, with windows being used to adjust the temperature. The turning serves to both moderate the temperature and disentangle the rootlets as the barley starts growing. During this process, important enzymes within the seed are activated, and begin to reproduce and to turn the more complex starches into simpler starches and sugars. Once the barley root is about is long as the barley seed, the process is halted. The barley is then loaded into a kiln, where it is heated to dry it. Originally, peat fires were used to dry the barley; now, oil or coal often used instead, with some peat thrown on the fire to provide the "traditional" peat (phenol) character to the malted barley when desired. Drying time is a function of method: with peat fire only, it might take 2-3 days; with oil heat only, it can be done in less than half the time. Today, there are very few traditional floor maltings; most of the distilleries use large communal drum or box maltings. Once the barley is dried, and allowed to stand for awhile, it is ready to be milled. Each distillery has their own mill, most of which are built along the same lines - screens and magnetic filters to remove trash, then two large cast iron rollers to crush the grain, followed by a cleaner. The rollers can be adjusted to produce the precise mix required by the distillery. A typical mixture is 70% heart, 20% husk, and 10% flour. Next comes the mashing process, in which the sugars and enzymes produced during malting are now extracted by hot water to form the working liquid for the next stage of the process. The mash tun is generally a large stainless steel or cast iron vessel which can hold from 4-12 tons of grain and upwards of 40,000 liters of water. The grain is added first, and then water is added in 3 or 4 batches (or washes). The first wash is usually about 64-70º C, and extracts the important enzymes and some sugars from the grain as it soaks down through and out through fine holes in the bottom of the tun, where it emerges as the liquid called worts. Tuns generally have some sort of moving arms that swirls through the mash, to speed the process along. The second wash is generally hotter, in the range of 75-85º C, and extracts more of the remaining sugars. The third (and fourth) wash may be slightly hotter still, and is generally cooled and then used as the first wash of the following cycle. Waste not, want not, is a recurring theme in Scottish whisky distilleries - not surprisingly, many are frequently marvels of efficient use of water and heat. Each wash generally takes about 4-6 hours, resulting in a mashing time of 12-18 hours, plus time to clean the draff (spent grains now useful as cattle feed) from the tun. Once enough wash is collected, they are put into another vessel known as a washback. Washbacks are where the process gets more exciting; yeast is added to the wash, and fermentation begins - sometimes violently. Washbacks are usually made out of larch or pine, although some more modern ones are made of stainless steel (in one case, stainless steel washbacks have been removed and replaced by more traditional wooden vessels once again). Washbacks vary widely in size, getting as large as 60,000 liters. Once the yeast is added, the process of brewing starts - the result, after 2-3 days, is essentially beer with a strength of 7-9% alcohol. This mildly alcoholic liquid is then used to load (or charge) the low wines still. Typically, these stills are copper pot (or batch) stills, unlike the continuous (Coffey or patent) stills used in the large grain distilleries. Over the course of a 4-6 hour run, about one third of the liquid continues on to the spirit still at about 30% alcohol. The spirit still is also run for about 6 hours, with spirit coming off starting at about 74-75% alcohol. This first spirit, known as the foreshots, is both unappetizing and potentially dangerous; it is diverted to a holding tank to be recycled. Once the alcohol drops to 71-72%, the middle (good) cut of the spirit is underway; this is what ultimately goes into the cask. Once the spirit strength has dropped to 60-62%, the liquid is again diverted for recycling; this liquid is known as the feints. Distilleries which try to stretch the middle cut will end up with a liquid which may smell more like gasoline than Scotch. Glenmorangie takes the narrowest cut in the industry, less than one third of the total spirit still run. Once the spirit run is finished, the resultant high-proof alcohol is cut with local water down to about 63-65%, and placed into casks for aging. And after three years of aging, it can legally be called Scotch. Ardbeg distillery was officially founded in 1815, although, as is the case (or claim, anyway) with many other distilleries, illicit distilling took place on the site for many years previous. The site meets all the requirements - as it is somewhat remote, well supplied with good, soft water, and is located on a small bay, providing access for supplies to arrive (and to escape via the sea if necessary). Shortly after its founding, Ardbeg was considered one of the larger distilleries, capable of producing 500 gallons per week. By Barnard's time, the output had increased to 5,000 gallons per week, with an annual production of 250,000 gallons. However, in more recent times, even though Ardbeg is an important component of many blends, it has only been run erratically. Until recently Ardbeg was owned by Allied Domecq (who also own Laphroaig), and most of the available money for refurbishment went into Laphroaig. 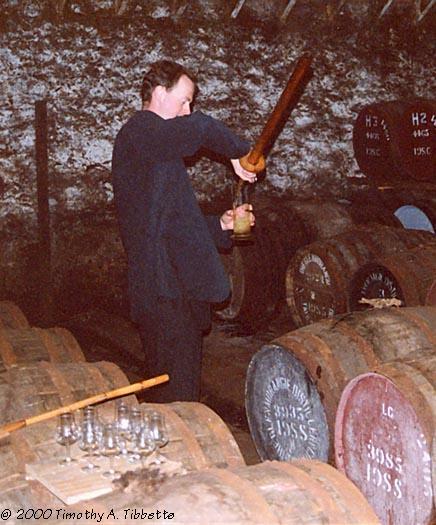 From 1981 to 1989, Ardbeg was shutdown; thereafter it operated only a few months per year to generate blending stocks. Thus, no ten year old stock is available; the ten year old on the market is closer to thirteen years old. If no new purchaser had been found, it is likely that Ardbeg would have been torn down within five years. The other two mothballed Islay distilleries, Port Ellen and Bruichladdich, may well suffer that fate, as they make a less-peated dram. The mainland distilleries already make too much lightly peated spirit for the blenders to use; they don't need anymore which has the added expense of being shipped back to the mainland from Islay. Fortunately for single malt aficionados everywhere, a white knight was found in the form of Macdonald & Muir, the owners of Glenmorangie. They paid £7,000,000 for Ardbeg. Of that amount, £5,500,000 was for stock, so the distillery itself came very cheap. 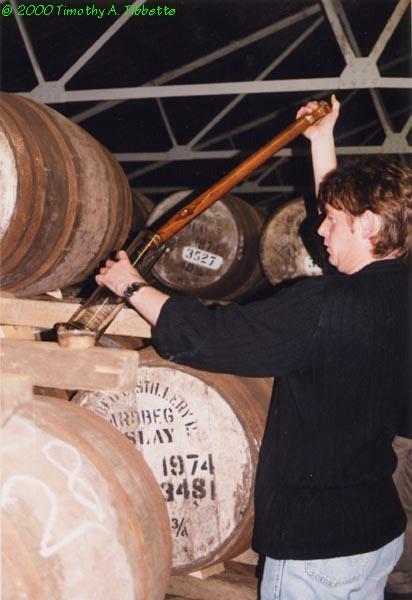 Under the new management, in 1997 Ardbeg undertook to increase production back up to reasonable levels. It took three months to get the distillery up and operational, about three weeks to get boiling. In spite of the antiquated equipment, which requires continual tinkering to keep in operation, the 1997 target of 500,000 liters was achieved by early October, allowing time for more modernizations and repairs to be carried out in the fall. Their maximum capacity in their current configuration is 750,000 liters/year. As a result of the limited running of Ardbeg, stocks are very limited. Stuart estimates three to five years will be required to bring the stocks back up to a comfortable level. Currently there are 18,000 casks in the warehouses, holding 2,200,000 liters. 52% of the stock is held by Allied Distillers, since it is so important to their blends. They have contracted with Ardbeg for 150,000 liters/year for the next five years. Two percent is owned by G&M. Ardbeg also has an agreement with Allied that they will not sell to G&M. They have produced around 2-3,000 bottles of the Ardbeg 30 year old, and Stuart doubts that they will do it again. Current offerings include a 17 year old, a 1978 vintage (about 20 years old), a 1975 vintage (about 23 years old), the Provenance (about 24 years old), and the 30 year old. The maltings at Ardbeg are no longer in use; the last batch of spirit to have been made using entirely on-site-peated malt was run in 1974. On-site malting continued for some years after, but it was augmented with malt from other sources. Some of this has been bottled in a special 24 year old Provenance bottling, currently retailing in the US for more that $500 per bottle. There are still 10 barrels in the warehouse from this run. One of the kilns has been turned into the visitor center; others still remain available if current opinion turns in favor of resuming malting on-site. The peat used at Ardbeg was somewhat unique in character, being taken from a peat bog two miles from the distillery, and completely free of sulfur, as well as being less than completely decomposed. The water supply is also critical; Ardbeg's supply originates in Loch Uigeadail in the hills north of the distillery. The water flows over quartzite, and then is diverted into Loch Iarnan, a lake sculpted out of the surrounding peat bogs; from here, the water flows through peat into the Ardbeg Burn, ending up at the distillery. Unlike many distilleries, they have no shortage of water; if there ever were a shortage on Islay, Ardbeg would be the last to close. Stuart believes that the current Ardbeg is more heavily peated than 20-25 years ago, although some people claim that at one time, Ardbeg ran 70+ ppm. Currently, they aim for 52+ ppm of phenols; this is in comparison with Laphroaig and Lagavulin which are in the 30-35 range, followed by Caol Ila at 30 (interestingly, Caol Ila was running an unpeated batch when we were there as an experiment), Bowmore at 20, and Bunnahabhain at 2. When Port Ellen was running, it fell into the Caol Ila range, and Bruichladdich tended to lie between Bowmore and Bunnahabhain. Most of the barley comes from the mainland - they are in the hands of the maltsters. The malt is stored in stainless steel bins. They had a Robert Boby grain mill installed in 1921 for £300 - new ones cost £60,000 now. Parts for the mill need to be made to order, but any Porteus grain mill mechanic can fix it (most of the newer mills are made by Porteus, but they are extremely similar) If any part breaks, it takes about 3 days to get it repaired. Ardbeg had to install new rollers recently; they should last 80 years - assuming no trash makes it through in the malt. The malt is screened prior to milling. They also have two magnets - which do find metal in the malt (such as washers); it comes from the lorries, ships, etc. A destoner is also used earlier in the process - and it generates about a small handful of stones in 30 minutes - perhaps a gallon a week. And this is after the malt has been destoned three times before it gets to Ardbeg. Lots of dust is generated in the process, and they worry about ignition of the dust by sparks from rocks or metal, as well as damage to the mill from the trash. Their grist schedule is 70% heart, 20% husk, 10% flour. Most of the phenol is contained in the husk, so the proper grinding of the malt is critical to maintaining phenol levels. By the time they get to the wash, they need to capture 18 ppm of the phenols; Laphroaig manages about 12. The rest evaporates, or ends up in draff (perhaps in turn imparting a smoky flavor to Islay beef or cheese?). The mash tun is still cast iron, as it was in Barnard's time, which is unusual these days; however, the current one is not the one he saw; this one was built in 1961. The current tun is on the floor, and has holes underneath for draining - making it difficult to get underneath to check. Due to the lack of clearance underneath, the tun is currently slated for repositioning (raising) to allow better access; this will in turn allow an increase in production. Four and one half tons of grist are currently used per mash, and ten mashes per week are run. Once the tun is raised up, they can go up to six tons per mash. Other upcoming modifications include replacement of the oversized grist case. Other aspects of the distillery have changed since the late 1800s; the open Morton refrigerators have been replaced by modern cooling units (leaving the last one in production use in Scotland at Edradour distillery in Pitlochry). The first wash uses 17,000 liters of water at 68° C and four and one half tons of grist; The second wash uses 8000 liters of water at 85° C. After enough wash is collected, they cut off the pumps. The third wash is used to restart the next cycle. They put 23,500 liters of wash into a washback, and expect 800 liters of alcohol from it. There are six washbacks. Three were unused at first, and removed. They have been replaced now with new Oregon Pine washbacks. The remaining three old ones are Larch. Because of the high content of phenols in the wash, they ferment 62-63 hours instead of the standard Speyside 45 hours. Running longer also provides other benefits; at Caol Ila, the washbacks are run longer to get the grassy, herbal nose; perhaps something similar is at work with Ardbeg to get its floral character. After fermentation, they have about 8% alcohol. The "beer" that results is very sweet and perfumed - Ardbeg is truly "distilled lager." Ardbeg stills are bigger than average in size, but shorter. They have one wash and one spirit still. The wash still can take a charge of about 18,000 liters, but they don't charge it that full, since the washbacks only hold 23,500 liters; thus they use one half the wash is in each charging of the wash still. Low wines are run for about 5 hours, and about 35% goes to the spirit still. The remainder, about 6,500 liters, is discharged. The spirit still is 50 years old and is too thin; it must be replaced next year. Since the normal life of a still like this is 15 years, it is easy to see how little Ardbeg has been run. The spirit is about 74-75% alcohol at the start (foreshots), and is diverted for the first 15 minutes. The middle cut starts at 72% and runs for three and one half to four hours, down to 61% alcohol. Then the remainder of the run is diverted as feints, down to 1%, where they shut off both stills. The strength falls off very rapidly below 61%. The remainder which is currently discharged into the sea may have to be cleaned/stored in the future. Of particular note is the purifier on the neck of the spirit still, which serves to recycle the heavier components back into the still. The lighter components tend to be sweeter and preferable. At Glenmorangie, the very tall stills (combined with the narrow middle cut) naturally take off the lighter components and leave the denser ones behind. At Ardbeg, everything is OK for the first hour or hour and a half, then the heavier components start going over. The purifier catches them, resulting in sort of a 2½ distillation process, which makes Ardbeg sweeter, more floral and citrusy. Springbank and Irish distilleries do something similar. The Ardbeg stills are three times the size of Laphroaig's stills; it is harder in the smaller stills to separate out the heavier components, so Laphroaig is a "denser" whisky, with more of the heavier components affecting the taste. No more than three fills of a cask are allowed. In the Provenance warehouse, the oldest cask is from 1974; they had to reroof this warehouse during the restoration. 98% of the casks are bourbon (G&M has some sherry casks). Peat is used on the floors of the warehouse - it holds in the moisture, which is good. Casks are stored only three high, since higher ones don't mature as fast. Stuart popped a 1974 Provenance, Cask #3481, 43 3/4 gallons, and used a copper thief to draw out a sample for us. What a sweet, rich, smoky whisky! Firm body, warming, long finish. A nine year old (cask #330) was hot and peppery, still sweet, but more tar. At Glenmorangie, references to distilling go back as far as 1640. However, the current distillery was not licensed until 1843; and, as previously mentioned, it did not take its current shape until the 1880s. In 1918, the Leith firm of Macdonald and Muir acquired the distillery, and have retained ownership ever since - a long time in the Scotch whisky business. During that time, the number of stills has doubled twice (to the current 8 stills), and Glenmorangie has gone from producing only 20,000 gallons of spirit per year to three million liters per year. They are also in the top five in local and export sales of single malt Scotch. Graham Eunson, the current distillery manager, is only the seventh since 1843; also quite a record in these days of frequent corporate turnovers. With Glenmorangie, one of the first things to get out of the way is how to pronounce the name. Usually, people are told that it rhyme with "Orangy". Graham Eunson tells a story of being in a bar, and having one of the patrons correct his pronunciation, insisting the accent is on the "ang" instead of the "mor". Graham politely corrects him, but the patron is having none of it. Finally, Graham pulls out one of his cards and hands it to the patron. Silence ensues. As with Ardbeg, Glenmorangie has several unusual characteristics, which likely contribute to its popular, well-regarded, and light, perfumy spirit. These include the "accidentally" tallest stills in Scotland, along with stainless steel washbacks, and a hard, mineralized water source. The stills are "accidental", because they were originally acquired secondhand from a gin distillery, when the distillery was rebuilt from scratch in the late 1800s (shortly after Barnard's visit.) The results were so good (and unique) that Glenmorangie would never change the shape of the stills now. In addition, their concern with the quality of the casks used (and their experiments in alternative woods), along with considerable marketing savvy have resulted in a wide range where almost anyone can find a dram to enjoy. Many distilleries go to great lengths to protect assets which they feel impacts their spirit - and Glenmorangie is no exception. They have bought the Tarlogie springs (their process water source), and also some Ozark mountainsides in the US to protect their source of oak. 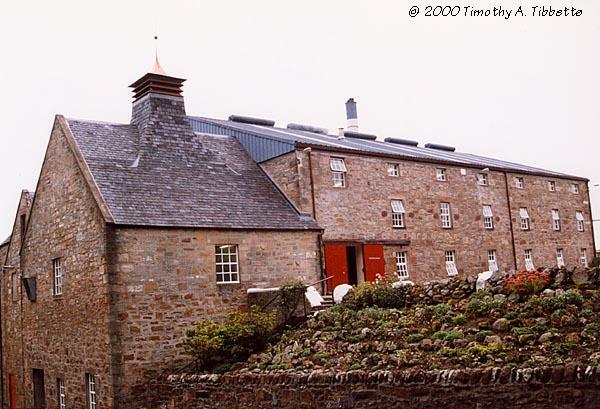 In the early 1970s, Glenmorangie needed to increase production, so they stopped malting on site and added more stills. They prefer to use Scottish barley, but take some from the UK, and some from Europe, requesting phenol levels of less than 2 ppm (generally 1-1.4) from the maltsters. Their operational season is 45 weeks, when they operate 24 hours per day, seven days a week - this requires 171 tons of malt per week. Production personnel number sixteen; hence the Sixteen Men of Tain. The water is hard, and substantially mineralized; they estimate that it fell as rain 100 years ago. The oak trees used for casks are also about 100 years old, producing a nice symmetry. They let the malt lie dormant for about 6 weeks before grinding. The first wash is 9½ tons grist with 40,000 liters of spring water at 64º C. The second wash is at 77-80º C, and the third wash becomes the 1st wash of the next batch. The first water is critical - too low a temperature, and the sugars become less extractable/soluble. Eight hours per mashing - they do six mashings and then clean. The mash tun is a stainless steel, full Lauter tun, with knives to help it drain better. The six washbacks are also stainless steel. Seven bags (7½ kg per) of yeast are used for the washbacks, of three different brands and two different types. They believe this mix improves both flavor and yield. Brewer's yeast is harder to get and store (comes as a liquid) - but liquid yeast is getting more common. There is no heating or cooling of the washbacks - and problems can arise on hot days if the temperature rises over 34º C. The pear drops smell (isomethyl acetate) in Glenmorangie comes in during the washback stage. All four spirit stills hold 8200 liters, and all four wash (low wines) stills hold 11,400 liters. The oldest still is the #4 spirit still, which is bolted together, not welded/formed like modern stills, and dates from about 1962. The spirit cut is taken from 72% to 60%. The necks of the stills are 16 feet, 10¼ inches. Glenmorangie effectively gets a reflux action (ala the purifiers of Ardbeg and Glen Grant), which acts as a purifier of the spirit. The spirit still runs for approximately 7½ hours, with 2½-3 hours of middle cut. There are 14 warehouses, including #15, 16, 17, and 18 (the still house used to be #2; they have no #1 or 5.) They use hogsheads (approximately 250 liters in size), which are made with American oak harvested from north facing slopes and air seasoned for 1½ years. They are filled with Kentucky Bourbon for 4 years. These "hoggies" end up costing 3-4 times the normal market price for casks (£140 versus £40), but Glenmorangie feels that it is well worth it. They use dunnage-type warehouses (earth floors, low roof). They use casks up to three times - 1st and 2nd fill casks are used in their single malts; 3rd fill casks are used for blends (of which they do very little). To compare the effects of 1st and 2nd fill casks, we sampled two casks which were filled within 2 days of each other. The first was a 2nd fill cask containing 10 year old spirit, which was lighter and fruitier, with more malt flavor coming through. A 1st fill cask, also containing 10 year old spirit was woodier, with more vanilla flavor and less fruit. Glenmorangie is also at the forefront of current experiments with alternative wood "finishes". We sampled a Madeira drum (the spirit had been finishing for 1½ years in it) - very strong Madeira flavor on the nose and palate - very dark color. There is currently a Claret finish on the market from Rothschild casks, with a total of 13-18 years in cask, including 8 years in the claret wood. The claret casks have since been refilled. Their standard line will be Sherry, Fino Sherry, Port, and Madeira finishes. The oldest cask "on site" is a 1974. The 1971 25 year old was when Glenmorangie had their own maltings. We were also given the chance to sample a "mystery cask". It was filled in 1983 with spirit which had spent 3 years in bourbon (from 1980), followed by 15 years finishing to date. Turned out to be a cognac cask - the cognac flavor was very much evident on the nose, and the spirit was "brandy-smooth". They filled a series of casks in 1993, as an experiment with different types of oak (e.g., swamp), which have NOT been used for bourbon. The various wood finishes have been on the market about 2 years, and are already up to 14% of sales. One of their worries is a shortage of Madeira casks (only 8000 in world - takes 100 years to properly mature Madeira). Certainly the whisky stable of Macdonald and Muir is hard to beat. With Glenmorangie, they have one of the most popular and widely known single malts in the world. It is one of the few distilleries which needs to send almost no whisky to blenders in order to make a profit. At the other end of the spectrum is Ardbeg, widely proclaimed as one of the best (if not the best) whisky in the world. Since these whiskies frequently appeal to different tastes, there is no cannibalization of the market by a stablemate. It should be an interesting future, once the restoration of Ardbeg is complete. Barnard, Alfred, The Whisky Distilleries of the United Kingdom, London: Harper, 1887; Reprinted by Newton Abbot in 1969; Extracts reprinted by Lochar Publishing & Mainstream Publishing of Edinburgh in 1987. Cribb, Stephen and Julie, Whisky on the Rocks - Origins of the 'Water of Life', British Geological Survey, 1998, 1st edition. MacLean, Charles, The Mitchell Beazley Pocket Whisky Book, Mitchell Beazley 1993. MacLean, Charles, The Glenmorangie Sesquicentennial Diary, 1993. Murray, Jim, The Complete Guide to Whiskey, Triumph Books, 1997.